New Heritage Interpretation Reference Collection. John received his B.S. (1976) and M.S. (1978) degrees majoring in Interpretive Services from The Ohio State University, with additional minors in marketing, motivational psychology, and advertising. During this time at OSU, John developed and taught a course on Interpretive Master Planning, was also on the staff of the Ohio State University Museum of Zoology (academic years) and spent five summers as an Interpretive Naturalist with Ohio State Parks. After graduating with his M.S. degree, John was recruited by Alberta Provincial Parks in Canada (1978-1980) as an interpretive planning consultant, where he helped develop interpretive plans for two World Heritage Sites (Head-Smashed-In Buffalo Jump and Dinosaur Provincial Park). In 1981 John returned to Michigan to teach introductory and advanced interpretation courses at Michigan State University, where he was also enrolled in the Ph.D. program (1981-1985). Besides interpretation, John studied recreational learning theory, consumer behavior, recreational marketing and survey research strategies. He has also been an Adjacent Professor for New York State Universities summer Heritage Tourism Institute, and for North Carolina State Universities summer Heritage Tourism Certificate Program for working tourism professionals. John also created two Heritage Interpretation courses for Newcastle University (England) for their MS global distance learning program in Heritage Management. 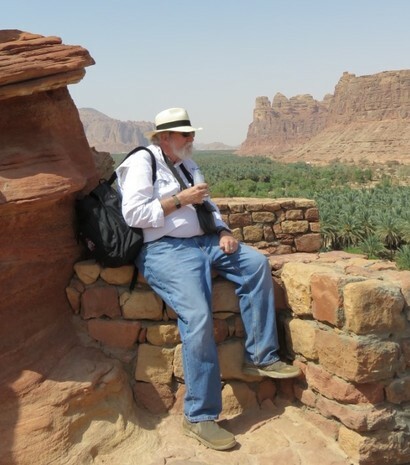 He lectures widely on Heritage Interpretation and Interpretation Planning, and serves as a consultant to many different agencies and organizations world-wide. -InterpNEWS - the International Heritage Interpretation e-magazine. in introductory and advanced heritage interpretation). -The Center for Interpretive Planning Advancement & Excellence. -Interpretive Evaluation, Visitor Studies and Site Assessment Center. John is a NAI Certified Interpretive Planner, Certified Interpretive Trainer, and Certified Professional Heritage Interpreter (Canada). He is also a National Association for Interpretation Fellow. Introduction - 40 + years minus 39 years. Way back in 1972 after several years in the Army, I was back at The Ohio State University starting to work on a degree majoring in ecology/zoology. The problem was I loved too many different things, archaeology, architecture, cultural heritage sites, museums, zoos, and on and on. As a part of my work study I had a job at the Ohio State University Museum of Zoology working in the malacology department (sea shells). But as this was an academic year appointment I needed a summer job. Thus, the "rest of the story". I saw an advertisement for seasonal naturalists with Ohio State Parks. I applied for a naturalist position and my new lifetime career was born. I worked 5 academic years at the Museum of Zoology and 5 summers as an interpretive naturalist until I graduated, after a change of majors, with my B.S and M.S. in Interpretation in 1978. I was lucky that OSU had interpretation as a major - took all the courses, and even was asked to teach a course in "Interpretive Master Planning" at OSU. Then got recruited to go to Alberta Provincial parks in Canada as an interpretive planning consultant for two years, and then recruited to go to Michigan State University to work on a Ph.D. in interpretation and take over teaching introductory and advanced interpretation courses there for 5 years. I loved consulting work more than teaching at a university, and have been working as an interpretive planner and trainer since then - my 40 years as a heritage interpreter well under way. 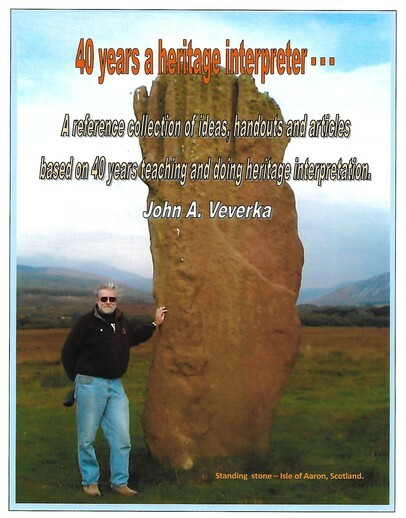 This is one of my collections of articles on interpretive theory and philosophy, handouts from some of my interpretive training courses and other interpretive ideas that I developed over the years. Some of these were just written the past year, some are older. The main job of a interpretive professional is to learn all you can about your profession, contribute ideas and theories about your profession, get loads of on-site experience "doing" interpretation, write more about what you learned and then… pass it on to others. So here you go. Note: It is the intent of this resource to allow other interpreters or interpretive trainers to freely use and copy any of these documents in their own interpretive training and to help advance the interpretive profession. Please reference any documents you may use for these purposes. Use the ideas and information - pass it on. John Veverka. Copyright 2018, John Veverka & Associates Heritage Interpretation Training Center Resource Manual, April, 2018. What articles, handout masters or other reference materials are in this collection/library? -When is "interpretation" NOT "interpretation"? -A guided tour of the COW museum... A lesson in interpretive theme development. -Interpretive Planning for the next millennium. -Why Heritage Sites Need Interpretation For Their Long Term Survival. -The Language of Live Interpretation - Making Contact. Planning for interpretive programs and media. -Tips and concepts for planning truly "Interpretive" Exhibits. -Evaluation for Children's Science Museum Exhibits. -If it Bugs you - eat it ! -Site museums vs. interpretation centers - The story before the artifacts. Why art often needs an interpreter's touch to be really understood. -Interpreting the "rest of the story" hidden in your artifacts. -Writing Museum Exhibit Label Copy that is truly "Interpretive". Planning and contracting for interpretive services. -Facilitating Focus Workshops for Interpretive Planning Projects. -Interpreting Critical Issues for Heritage Resource Management. It's all about the visitors. -Developing Marketing Brochures and Technical Bulletins. If you would like a copy, sent to you as a PDF E-book, the cost for the publication is $50.00 USD. You may pay for your copy by using PayPal or Credit Card below. Upon our receipt of your payment a copy of the publication will be sent to you as an e-mail PDF attachment.